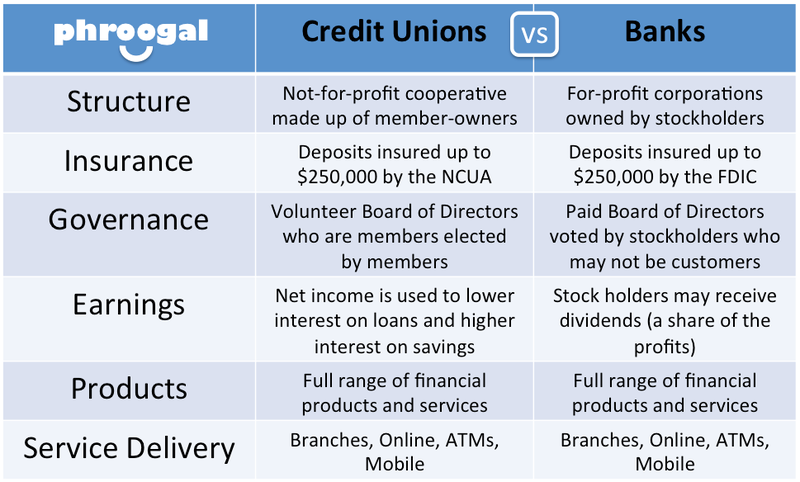 In this short article I will discuss the fundamental differences between banks and credit unions without trying to conclude whether one is better than the other. I also won’t quote rates or services they each offer since each individual should decide upon their due diligence which institution would serve his best interest. Both, banks and credit unions offer many overlapping services. They offer various financial services including checking accounts, savings and individual retirement accounts, and a variety of loans (from mortgage loans to consumer loans). The key difference is the ownership structure however. Banks are corporations that are owned by their stockholders. Larger banks cater primarily to their stockholders, who are typically Wall Street institutions. The smaller neighborhood and regional banks tend to have more local ownership. Credit unions, on the other hand, are owned by its members. While there are differences at the level of ownership note that both are in business to make money. Like any business out there they need to make profits to stay in business. However, they each allocate the profits in different ways. Banks send their profits to their stockholders and credit unions pass their profits on to their members (dividends and sometimes lower rates). Because of the ownership structure there are different outcomes during challenging economic times. Now this is where you may be tempted to favor the credit unions, especially if you’re not too fond of Wall Street (and its power over the government’s bureaucratic system). When large banks fail Wall Street has the power to – which it uses – lobby the government and the politicians to make unwise decisions for short term gains at the expense of the general population. Under similar economic climate Wall Street can not pressure credit unions to make such decisions at the expense of the credit unions’ members. During the credit boom era large banks (under intense pressure from Wall Street) made loads of high-risk loans, bundled them up in mortgage securities and sold them to FannieMae and FreddieMac. We’re all aware what happened with these institutions during the mortgage crisis of 2008-2009. Banks were allowed to pass on the risk to these quasi governmental institutions and encouraged to engage in such behavior. Credit unions on the other hand were free to make sound and rational decisions in the best interests of their members, not Wall Street. According to information published by the Federal Deposit Insurance Corporation (FDIC) and the National Credit Union Association (NCUA), banks were failing at a rate 3 times higher than credit unions in 2008, and had an overall failure rate of five times that of credit unions. Generally speaking, during good times, credit unions have established great track records. And when times are tough, their interest stays local (to their members) and it’s obvious there is no comparison. Finally, I do offer both, bank and credit union loans, so if you’re in the market to secure a mortgage for investment purposes please contact me.